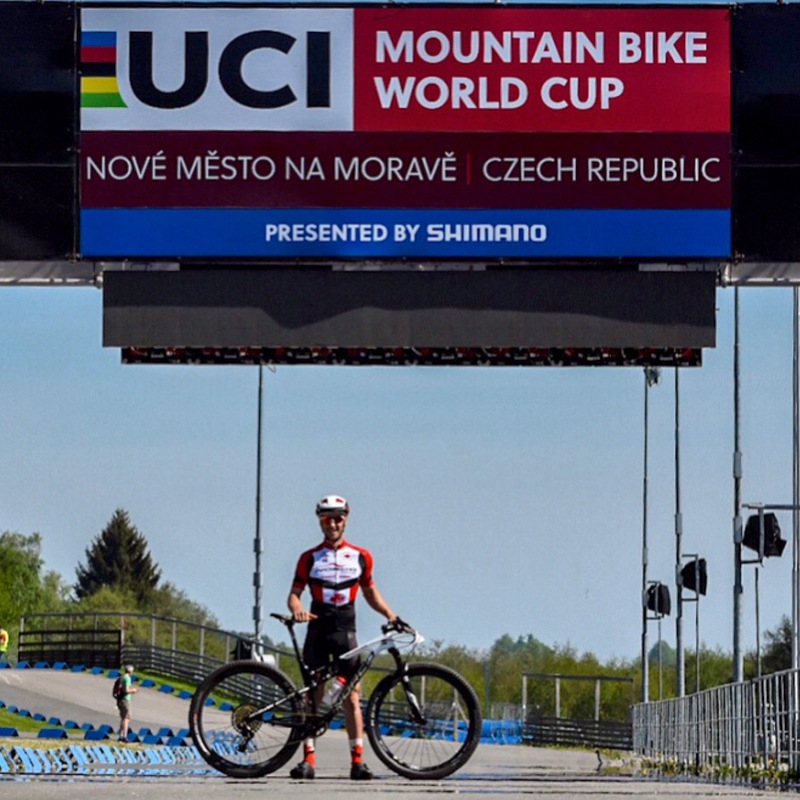 The World Cup in Nove Mesto Na Morave, Czech Republic is by far one of the best courses and venues of the year. The big grand stands in the forest at certain features complete with $1.50 beer refills and sausages roasting away next to the course are a big hit with the fans. As a spectator, it doesn’t get any better than NMNM. As a rider, this course is epic! There are some rad features, some solid technical sections, and more exposed roots than there are grains of sand on all the nudie beaches in Europe. That being said, the Norco Revolver FS was the way to roll. Friends don’t let friends ride hard-tails in Czech. It was a lovely week leading into the race filled with beautiful countryside rides, rolling hills, and good euro living. Preparing for the race was easy and stress free. I got the course dialed-in early and was ready to rest up for the big show. Race time was 10am which was ideal as you don’t have to wait around all day, but also don’t have to wake up early. I was starting in 25th position, so I would have the first pick of my spot on the 4th row. That being said, where you’re expected to line up doesn’t necessarily mean much since guys tend to push past and crunch up to the front. I knew what I had to do to remain safe on the start – get out front. I do have to say, it was fun to be leading a world cup again for the short bit on the start loop. Heading out on the first lap I was able to tag the front group with 5 or 6 other dudes. Battling at the head of the race, I decided to remain conservative and not get caught up with the inevitable positioning skirmishes. I also felt great on the descents and had no issue closing small gaps in those sections. Mid-race, podium slipped away after some juicy bombs were thrown, blowing up our group. I slipped off pace a little and lost some spots nearing the end of the race and couldn’t quite manage the speed necessary to take the free ride when guys were going past me. I fought hard to hold that top 10, and pleased with this result, I considered it definitely a solid benchmark to work off of this season. 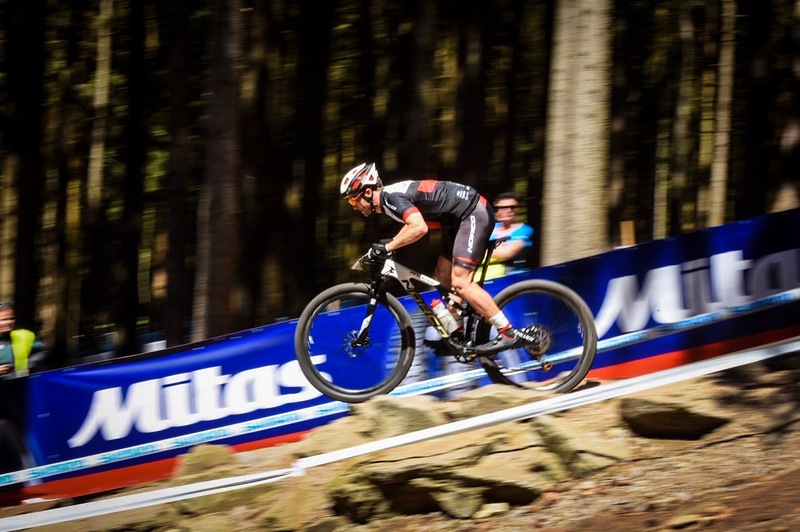 World Cup #1 was also the maiden voyage for the Norco Factory Team – now a full-blown UCI World Cup team. Haley Smith and I were the athletes for this expedition with my little brother Quinton holding it down at the Canada Cups back home. I am so thankful to have the familiar set up, staff, and support of the Norco Factory team again in Europe! Needless to say, bikes were dialed with the help of our sponsors and their continued support. The course was super nasty and rough on the bikes, and having Sram present to rebuild my RockShox suspension after training made race day that much smoother. Kenda’s new 2.2 Kozmics were the perfect mix of tremendously fast, tacky traction together with compliance on such a gnarly course. HT pedals keep us mounted to the bike, and Smith keeps both the course and my race face looking sharp. I left this first world cup with high hopes for Germany and feeling like things were shaping up to be a breakthrough year. Boom. World Cup #2 was a hit! I’ve flown over the moon and am just coming back to Earth now to pound out this blog. Looking back, I find myself at a loss for words. It was definitely a successful day on the bike, and although not the best riding I’ve ever produced, the result sure was my best so far! Although over the moon with my result, there’s always room to critique and to grow as a rider. The course in Albstadt is not my favourite. Its long gravel climbs, gravel single track and heavily armored descents definitely make it a chore in some sections. To complicate things technically, by race-day the course ends up getting one line burnt into it, and straying even a few inches into the loose gravel at speed can be very costly. This year the course was completely dry and super fast. It was definitely a bit scary bombing the loose sections. Race day was pretty hot, like Sea Otter hot, so I knew it was going to be a good day. Things got quite sweaty in the warm up – trainers will do that. The nutrition side of things was a big focus for WC#2. This meant carb counting to ensure I’d be adequately fuelled for the event’s entirety. With the help of Ashley Armstrong as my nutrition sounding board, I got it right and my last lap ended up being my fastest. From a nutrition standpoint I was well fueled with no fading, but there were other factors that went into making this my fastest lap. The race was pretty standard, yet extremely surreal. 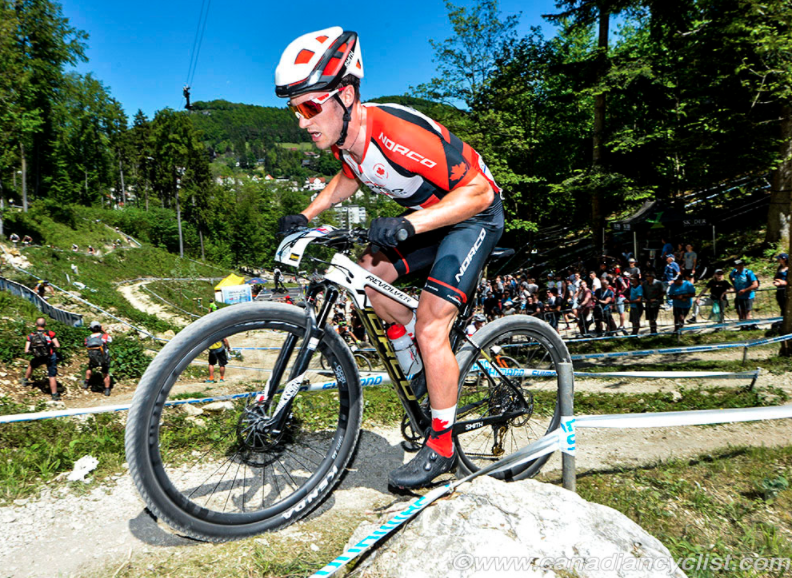 Starting on the front line at a World Cup hasn’t happened since I won the Mont St. Anne World Cup as a junior, and it sure makes the start a load easier. I had a medium strong start dropping into the first downhill in 5th. By the end of the first lap my fellow rider Nadir Colledani had to pit after crashing, leaving me by myself at the front of the race with a 15 second gap over a massive group of chasers. I rode steady and smart knowing that I would most likely be caught. I can’t tell you how long I lead the World Cup for, I think it was about a lap and a half but I wasn’t counting. With a slightly smaller chase group finally making contact, I found myself in a group for top 5 after being on my own. Nadir and Georg Egger went off the front, I chased, but slipped off pace. They would stay away to take 1st and 2nd respectively, leaving Gioele, Petter and I to battle it out for 3rd. Petter got a flat and on the last lap, and I put the gears to Gioele. I punched every climb with everything I had. It worked. I got a gap and was home free for a podium spot, until I messed up on the final corner of the descent. I didn’t go down but I lost a ton of speed. Had to punch it hard, and the race came down to a sprint finish! I finished with 3rd place on the day, and quite a day it was. 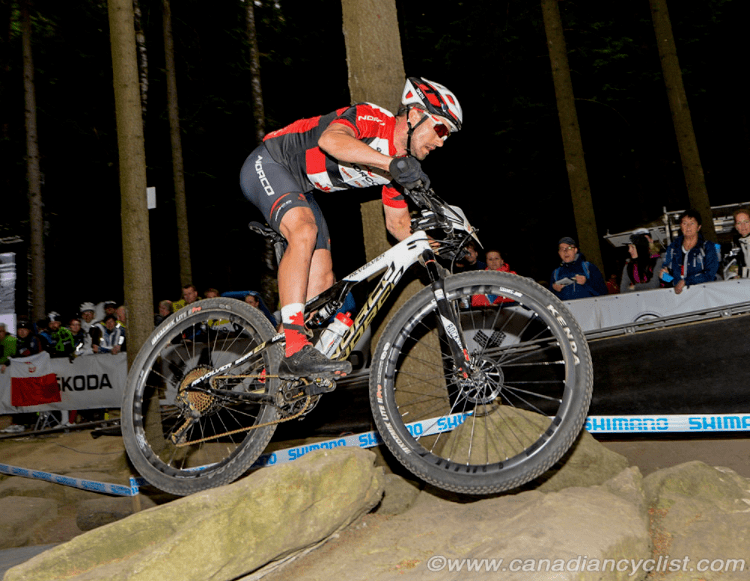 A huge thank you goes out to the Norco Bicycles family for their continued support and all of our amazing sponsors who make events like these possible. The outpouring of encouragement and congratulations from friends and family back home has made this podium-finish even more special, and I’m looking forward to returning to Europe in the coming weeks with my brother Quinton completing the Norco Factory team. Be sure to check Media Page for interviews.